Flash Cards Especially for Boys! I have several children in my life that are learning to either read or their alphabet. What better way to do that than with flash cards. Peyton is now 5 and I think we are on our third or fourth flash card kit. But my nephew is just starting to learn his letters and what better way than a set of flash cards that will interest and engage him? Kids learn faster if they are having fun. ALHPHA cards by He’s All Boy are a fun set of flash cards made especially for little boys. They capture the humor and essence of little muddy faced boys everywhere. Included in each deck is the complete alphabet. One side of the card shows the letter in upper case and two corresponding words with a cartoon drawing demonstrating the words. I must say H is my favorite. A Hairy Hippo! Or S for Snake Spit. What little boy would not love it? Then on the other side of the card is the upper case and lower case version of the letter. Each card is engaging and entertaining. My nephew thought they were a hoot! Even my daughter, whose 5 years old, and my older nephew, whose 9 years old, enjoyed looking at each card. The older kids even tried thinking of more words beginning with the letter of the cards and tried to form stories off them based on the picture on the letter’s card. 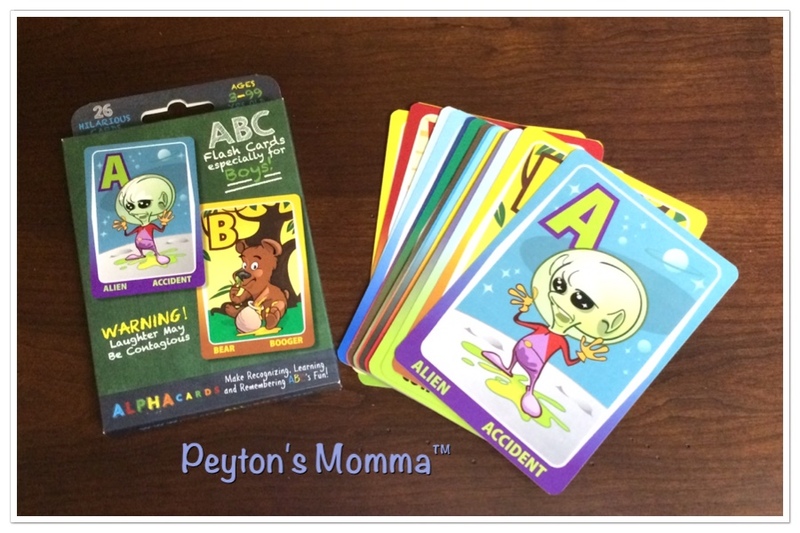 The flash cards from He is All Boy is perfect for getting children to engage and have a blast while learning the alphabet and a few words for each letter. Your child is sure to be giggling as you work you way through the 26 cards. We made a video so you can see each and every card and what you will be getting. Each card is unique, funny and well illustrated. Your little boy will be sure to love them! You can pick up your deck of Flash Cards by He is All Boy online. Connect with He is All Boy online, Facebook, Twitter, Instagram or Pinterest. Ha, what a super idea! Wish they had these creative things when my kids were small.